Sussex County, Delaware – This once-a-year wrestling tournament was held at the Indian River High School located in Dagsboro, Delaware. 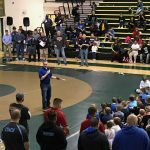 Families from Delaware and several surrounding states came for this awesome opportunity to compete. The Delaware State Police Honor Guard commanded by Captain Jason Sapp presented the colors to begin the event. The National Anthem was performed by Adria Windish, daughter of Lieutenant Gerald & Lynn Windish. 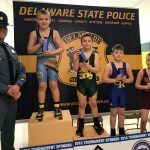 On Saturday, December 29, 2018, the Delaware State Police hosted this prestigious event; the 7th Annual Camp Barnes Wrestling Classic. 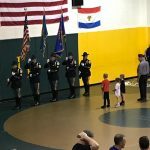 Some experienced wrestlers were on hand and some for the first time. 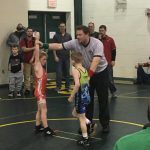 Just like the kids, many parents embraced the opportunity to have some fun and welcomed the chance for their children to work on and share wrestling skills. 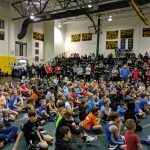 There were 302 determined wrestling participants from the Mid-Atlantic Region which included the following five states; Delaware, Maryland, Virginia, Pennsylvania and New Jersey. The wrestlers who participated in this event and fiercely competed ranged from the age of four to 14 years old. There are also a host of generous volunteers, sponsors and parents that help with this event and without their assistance, the success of this event wouldn’t be possible. 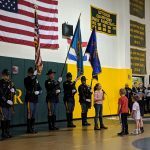 The sponsors who helped make this event happen are the Delaware State Troopers Association, Harvard Business Services, Inc. and JD Shuckers Restaurant. 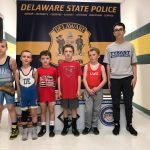 The Delaware State Police thanks everyone who helped make this outreach event and wrestling tournament a tremendous success! The proceeds from this event go toward helping Camp Barnes, a nonprofit organization operated by the Delaware State Police, which is located near Bethany Beach, Delaware. During the summer months, Camp Barnes hosts approximately 360 children from up and down the First State. This topnotch camp is offered to those between the ages of 10-13 and is a free week-long adventurous retreat. Southern Delaware’s overnight summer camp features traditional camp activities and opportunities for attendees to enjoy recreational and camp-type activities including swimming, kayaking, archery, crafts, fishing, crabbing, canoeing and playing team sports. 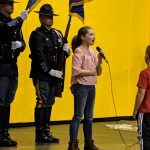 They demonstrate their skills at a weekly talent show and hang out with representatives from the Delaware State Police, the State Division of Fish and Wildlife, the Delaware Attorney General’s Office and the Girl Scouts of America.